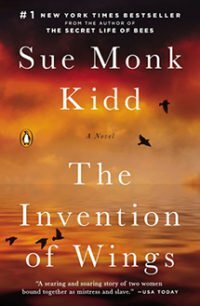 “Sue Monk Kidd’s sweeping new novel is set in motion on Sarah’s eleventh birthday in 1803, when she is given ownership of ten-year-old Handful, who is to be her waiting maid. We follow their remarkable journeys over the next thirty-five years, as both strive for a life of their own, dramatically shaping each other’s destinies and forming a complex relationship marked by guilt, defiance, estrangement, and the uneasy ways of love. It’s hard to believe tonight was our last meeting of 2016! That was one fast trip around the sun. We were a small group and all in agreement (Whoohooo!) that The Invention of Wings is a wonderful book filled with interesting, well developed characters. It was easy to read and kept our attention to the end. Only after finishing the book did we learn that many of the characters were based on real people. That was a lovely bonus. We all agreed that we want to know what happens next in the story. What becomes of Handful? Liz thought it would be so great to have her hook into the underground railway and end up in Canada. We like that idea! A big thank you to our host for an amazing night. Wonderful food, ambiance and company. It was so lovely we didn’t want to leave – 10:30pm must be a record! Even without a voice Toddy you rocked it, and thanks too for sharing your Christmas tree story – left us all feeling warm and fuzzy. 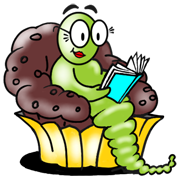 A very Merry Christmas wormies. See you all in 2017!